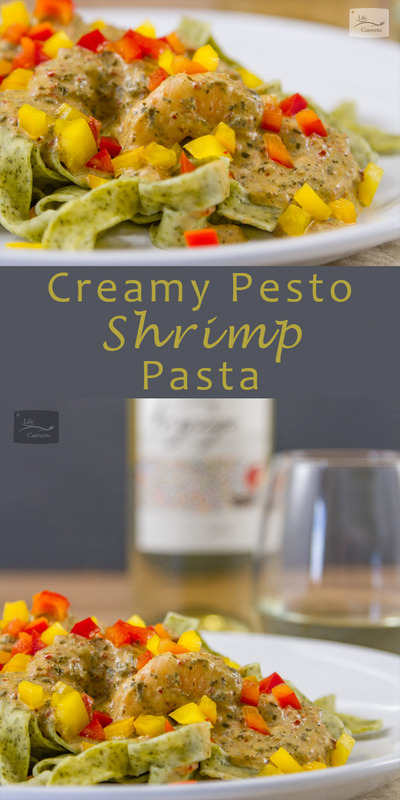 Creamy Pesto Pasta with a luscious creamy sauce that only has 3 ingredients! This post is sponsored by Grocery Outlet Inc, but the content and opinions are my own. So, I decided to make up a really quick and easy recipe using this pesto. Now, selections vary by store, so if your store doesn’t have this exact pesto, don’t fret, you can use another pesto. Or, you can use homemade pesto; I saw all the ingredients to make your own pesto at the Grocery Outlet too. Here’s my recipe for traditional basil pesto or Sun-Dried Tomato Pesto. Don’t forget to head over to The Grocery Outlet’s website to sign up for their WOW alerts by entering your email and selecting a neighborhood store. Pour shrimp and sauce over cooked pasta, and sprinkle with red and yellow pepper pieces. What a delicious dinner…definitely my kind of meal! That looks so creamy and delicious. This looks anything but quick and easy which I love! I love quick meals!!! This looks sooooo good!!!!!!!!!!!!!!!!!!!!!! I need to visit Grocery Outlet – since we moved, it fell off my shopping radar. Obviously that needs to change as this looks just amazing! This looks totally droolworthy! Love it and will definitely be putting it on the menu soon! That sauce looks so creamy and delicious! This shrimp dish looks so good and simple to make! Shopping at Grocery Outlet is so fun. You never know what deal you’ll find. I love that they have organic foods that are reasonably priced! Pasta is such a great base for just about anything! I love that you dressed up the pesto and added more to it! Such a great weeknight recipe that is sure to please everyone! This shrimp is making my mouth water. I have to check out Grocery Outlet and then make this recipe. Substitute zoodles (zucchini noodles) for pasta, and this makes a delish dish for low carb or ketogenic diets. Yes, I will be eating this and losing 5 lb this week.